It is said that there are no future plans for the Wolf3D Dome and updates will be at wolfensteingoodies and wolfenvault. But there have been no updates at those sites since 2016 and 2017 respectively. The Wolfenstein 3D Dome and those who update it have been a pillar of the community for as long as I can remember, and it's certainly been shown that the Dome, as a genuine source of all things wolfenstein, cannot be replaced. Well, you know, I am working on a new Dome currently. Having finished Kurlandfront, I've now more time to do that. It's slowly progressing, but a preview is available at http://www.m40.nl/ . So, in short - the Dome will be back up, now called the Front. It will be a combination of all old and new Wolfenstein websites, with all add-ons etc. The Dome news will also make a comeback, but not in the format it was - I've way too little time to update on upcoming mods and such. Released mods will be added to the news and to the website as they are released. But what with sites like ModDB, I'm not sure if that's really necessary. The Front is now 3-4 years in work? 2 years ago it was at 90% finished and about to open or not. As an additional website one day it sounds good. The more the better. As a Dome replacement it should have something or someone reliable with a biiiiiit more frequent updates. This century > I guess I won't live much longer than 30 years from now, so I thought so. Front 3-4 years in work > Well, yes and no. It's been tinkered with quite some time, but not 3 years fulltime, no. I've got a fulltime job and everything. Plus Kurlandfront development took all my time. Contentwise it's still 90% done, but adding everything to the new website format has not been done. Reliability > Well, if I'm not reliable enough for you, there's not much I can do about that. But you're right, I'm not qualified to do a Dome replacement. Frequent updates > Well, realistically the frequency of updates I have in mind are what I can offer. Perhaps you're right - I shouldn't do this. Let others make a great Wolfenstein website - looking forward to visiting them. People should not forget that what made the Dome as stable and frequently updated as it was in its heyday, had much to do with how much work people sent in. Also, Brian was retired (correct?) and as such had a lot of time for managing the Dome, answering the e-mails, even answering questions for newbies like me no matter how ridiculous or incomprehensible they were... And there just isn't a character in the community left with that much spaciousness. A few years back Andy ran an ersatz Dome, as he called it, via threads here on the DieHard Wolfers' forum. And it was great, and he and I talked about re-booting the Dome in some shape or other. But he disappeared without a trace, more than three years ago (wow!) and I think what Tristan has presented over the years has been of valid enough quality. I share his preoccupation having both a job as well as school and many other priorities. So I can understand how frustrating it must be. If things could be different, there should be a sprawling, living Dome, there should be proper mod listings (chronological/TC/map sets etc.) ... Picks of the day, throwback Thursdays or whatever, starter kits for people new to the whole thing (EXE with fancy coding, easy-to-grasp map/graphic editors etc. ), interviews with modders and players, some sort of link-up with the YouTube long plays thing which seem to be somewhat a thing with a lot of views and such, but is there somebody out there with the necessary amount of time on their hands? If anything, the new Dome must/will be a joint effort between people who have a good rapport with each other, always answers e-mails or chat messages or whatever it might be... Something that is stable, but in a different climate where it is respected that this is all done as a hobby by people who has this as a hobby and not a full-time occupation. Just my two cents. For about 4 years the Dome is totally frozen cause of that. No clue how much traffic it lost and how much it still got. Stathmk's Wolfenstein Goodies isn't the best site but it had bit of news between all of its insanity. I will archive the current Dome website and upload it to archive.org. The final days of the old version of the website need to be preserved. 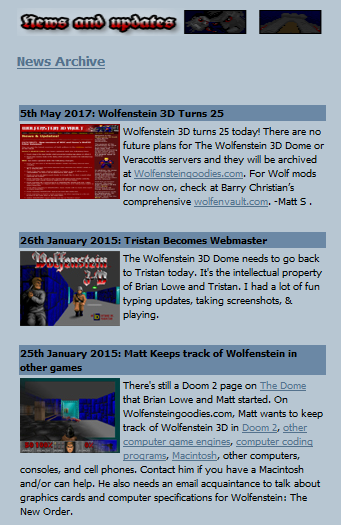 I have everything up to Wolfenstein 3D's 20th anniversary archived. I'd rather you didn't. The old version will be retained in some form. But thanks anyway. It's old post but would you keep the old Dome as it was around or would you format it or even remove it totally if the new site launches? Maybe you have a good reason for all, maybe not. So far it's far from convincing me. Make it simple first and readable. Put it online. Update the design and add content bit by bit on a regular pattern while it's online. Saves times and might keep people interested to revisit it since there won't be as many mods or news as there used to be. I know everyone is busy these days and has a life or not. As Thomas said get a handful of people that can contribute to it to keep it running. I guess me and Nexion wouldn't have problem to send in some news/links. Nexion has been doing that few years ago, also finding mods that would have went under the radar, for Brian and the Dome. Get a decent domain, host/server (maybe a raspberry and someone with stable home internet) + backup person so it won't go offline after months, the site would have to move and in the end all website files are at 1 person that is missing in action. What if DHW goes away, what would be the next pillar of the community.. Haven forum? Do we have a Discord ? The Wolf3D Community became as big as it did because it had stable, reliable online sources for many years. These days, a new site will show up every now and then, updates will slow down after around twelve months, and often times the plug will be pulled on them after two or three years (rendering it inactive or even offline as a whole). No community of any kind can become large and popular when those things are going against them ... no matter what its content. To have a stable fan base, you have to have stable online sources. We still have moddb for alot of Wolf3D mods, one can just search many wolf3d mods there and get list of such. I wish more mods would be released on that platform that remembers mods forever and sorts them. Thomas, I wonder why you didn't reply to my PM from August about our mod's testing. It's a big pity for me...but too late for that now. Maybe the "next wolf3d dome mod database" could have the themes (scifi, horror, pirates, ww2, etc) listed for each mod. Giving people choice to find mods by themes/genres would be nice. Somehow I had told myself that I had replied to you... Very strange. In the week you sent it (August 4) I was very busy at work, being the only one not on holiday. So I must have let it slip. Beta testing, usually I would love to partake, but these days I'm so busy I probably wouldn't be of any use. I was not on the scene during the Dome's heyday, but I can clearly see how important it was/is to the modding community. I do wonder why specifically there was such a decline in modding, whether it was simply the age of the game, or that the majority of people making mods had grown-out of it, but I think if we make a more refined site at some point in time in the future, it could increase our numbers dramatically. Brian Lowe had suffered problems with his hand, and while he was able to do back into the scene temporarily after that, he eventually had to bow out from management of the Dome altogether. While other people have taken the reins of the Dome since then, it wasn't updated nearly as often as it used to be. Then BrotherTank had to take a less active role in Wolf3D when he suffered health problems. In BT's case, this was because of a car accident he was in. These were two serious blows that the Wolf3D community never fully recovered from. There were other things that happened, yes - AReyeP, MCS, and Chris gradually became less active, Ripper and Majik Monkee started having problems finding reliable severs for their files ... the list goes on. But I think the community would've been a lot stronger today had fate taken a different turn for Brian and BT. I myself have been less active in Wolf3D than I used to be, but I honestly don't know how big an effect I had on the community in the first place. I did a handful of mods, posted a few bugfixes, posted a few tutorials, and filled in a few holes for people (be it maps, music, or Wolf3D-related uploads). My inferiority complex keeps me from seeing how big an effect I have on the people I interact with (unless of course it's in a negative way, which I try to be mindful of). But my goal is really to be a positive influence on people ... no matter what community I'm in. Has that happened here? Probably. But I try not to make conclusions without anything to back them up. My BoA involvement had some effect, but TR was most affected by lack of active mappers - RonWolf mapping pause in particular. That’s why we went into making advanced revisions of older mappacks (and will keep that route, seeing good feedbacks). Our big TC sequel got stalled too, as other big plans. Also recently im navigating slowly into indie territory, follow indie groups, trying to develop my indie dreams, based on my long-time love for retro racers which predates love for shooters. Donnow what will happen, so far coding is not my thing, struggling much. After modding - retro-style indie is the natural next step, but it requires new skills and excellences, so there is a big chance for me to fail at this with a grand flop. Anyway still actively develop mods - both wolf3d and BoA, don’t plan to quit anytime soon. Still, heart and mind are at RaceCraft concept currently.